The spike in the use of renewable sources of energy has rendered the stabilization of electricity networks more difficult than ever before. Redox flow batteries might come in handy in overcoming this difficulty. Scientists from Johannes Gutenberg University Mainz (JGU) have been working on a joint collaboration the goal of which is to produce innovative electrolytes for redox flow batteries by using lignin—a waste product from the wood pulp production process. The Mainz-based team of Chemists and their partners in industry and the academic realm have thus endeavored to recognize renewable raw materials with the ability to enable highly efficient production of sustainable energies. Although until now vanadium, a metal, has been predominantly used in flow batteries, it is less abundant and also costly. The study offers Professor Siegfried Waldvogel’s team at the JGU Institute of Organic Chemistry access to an innovative research area where they can apply their expertise of many years in the field of electrochemistry. Up to eight different experiments can be simultaneously performed in this screening electrolyzer. Each small plastic cup houses two electrodes. CREDIT: Carsten Siering. The Researchers intend to use lignin to develop fitting redox pairs to be used in redox flow batteries. Lignin normally ensures stability in plants and wood. The redox pairs get charged in the flow battery electrolyte and are subsequently stored in different tanks. According to the needs, they are then reintegrated inside a galvanic cell for producing energy. By subjecting the waste sludge from paper and pulp production to electrochemical decomposition we can obtain quinones, which we can then further process so they are suitable for use in organic batteries. The German Federal Ministry of Food and Agriculture has funded the study until January 2019. “We are placing increasing emphasis on electrosynthesis here in Mainz,” further stated Waldvogel, who has endeavored to thoroughly set up this area of research at Johannes Gutenberg University Mainz from the year 2010. In the past 3 years, he and his colleagues have attained funding worth 4 million Euros for new studies in this area. Put simply, electrosynthesis involves using electricity as a reagent, where the corresponding electrons are used for oxidizing or reducing organic substances. In contrast to using traditional reagents, assuming the electrical current is produced from renewable sources of energy, this technique is inexpensive and more environment-friendly. The electrification of chemical synthesis is currently a really hot topic and the expectation is that this will revolutionize industrial production worldwide in future. To date, very few electrosynthesis-based methods for industrial production of molecules have been feasible. A recent accomplishment of Professor Siegfried Waldvogel and his colleagues is designing a technique that makes synthesis of vanillin, a flavoring agent, from waste wood feasible. Moreover, this method also allows the Scientists to more rapidly synthesize specific adjuvant substances that can be used during chemical reactions. A specific achievement is a method created in cooperation with Novartis for modifying a pharmaceutical component: as traditional techniques were found to be inefficacious, the Scientists at Mainz could synthesize the product by just adopting electrochemical transformation. According to Waldvogel, the capability of electrosynthesis is far beyond just synthesizing fragrances, flavoring agents and active agents. He believes that it can also be used to produce distinctive products for the agrochemical industry and also molecules that are highly significant in the field of materials science. The new method enables abridging numerous phases of traditional manufacturing processes. Also, the method decreases the reliance on less abundant raw materials necessary for producing the needed chemical reagents. 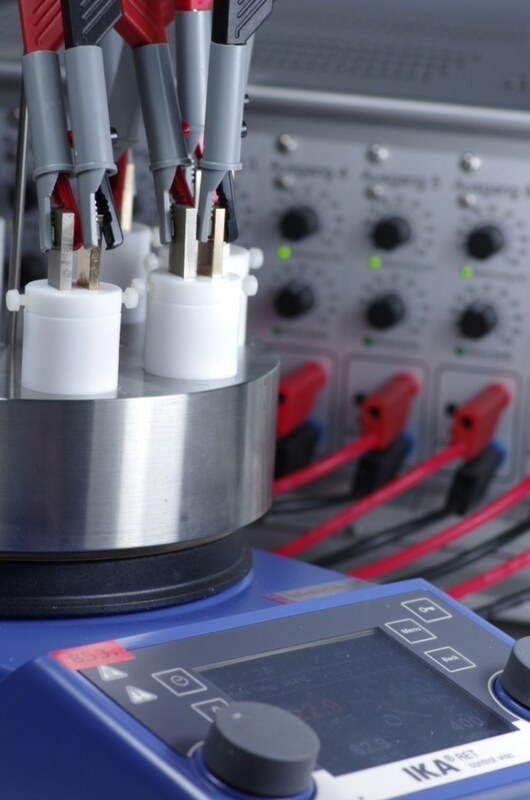 The flow electrolyzer prototypes used for electrochemical reactions in the Researchers’ laboratory were developed and synthesized in JGU’s own workshop.